A new version of QuickMon is available. Add option to ‘not check’ URL on exit(ok button) when editing config to Ping, Performance counter and file system collectors. Update: found a bug when saving templates. Fixed now. Just a heads-up that version 5.1.1. has been released. Also, I forgot to post about version 5.1 which is the first version that made a major change in the .Net dependency. Since .Net 4.5.2 is the oldest version of .Net still supported by Microsoft the whole tool has been recompiled to use .Net 4.5.2. It (the .Net version) does not provide any new functionality as such. Added Jumplist shortcuts – Shortcuts available on right-click on the Windows Taskbar. Not going to repeat all the release notes here but basically this release improves on using config variables while editing the config. I’ve added a small but useful piece of functionality (probably long overdue) to the File/Directory collector of QuickMon. You can now specify the last X number of lines of a text file to check for the specified text to search for. This is specifically intended for checking Text log files where lines of text are appended the whole time. 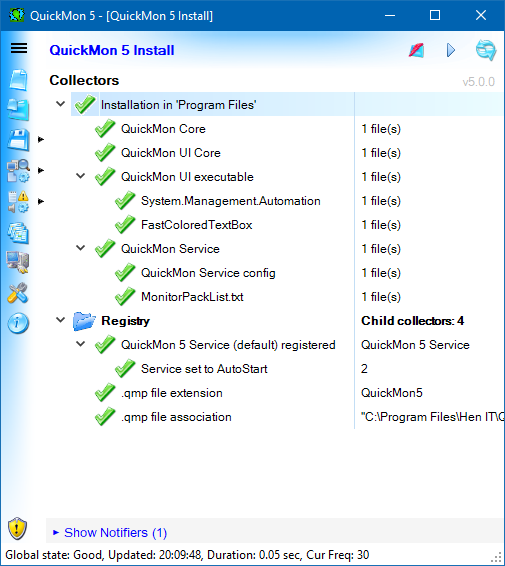 Just a quick post to announce the first (official) release of QuickMon 4. There might be some minor bugs that must be ironed out but the basic product is done.